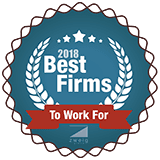 EMC Engineering Services, Inc. is excited to announce that they were named #15 on Zweig Group’s 2018 Best Firms To Work For. Zweig Group’s full press release follows. EMC Engineering Services, Inc. Celebrates 40 years in business!